Select a sturdy 3-ring binder, 3 inches in width, with multiple pockets. This will provide enough room to insert product catalogs, brochures, paint color charts, drawings and other information you will need to share. Purchase 8 ½” x 11” clear sheet protectors for filing photos and pages from magazines. This a great way to organize ideas you’ve collected without having to punch holes in pages only to have them tear. The sheet protectors are also helpful for filing drawings and notes. 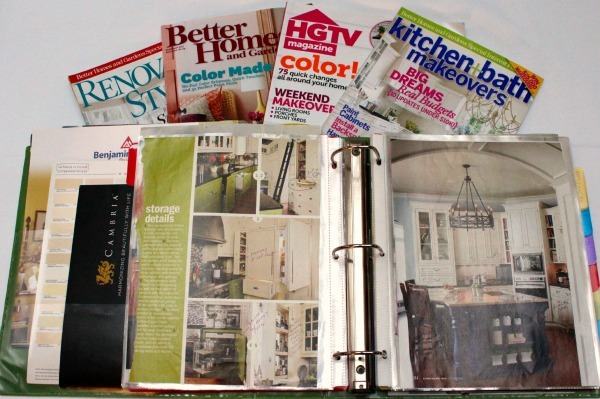 Sheet protectors are often sold in 100 count packages and cost between $10 and $13 but are worth having for anything you may file later including recipes and scrapbook pages. Use tabbed index dividers with pockets. Five to eight count dividers are helpful for organizing a binder. You may want to set it up for ideas, budget, drawings/plans, contract, change orders, products and other categories essential to your project. Pockets help to keep notes, brochures, receipts and other information organized and easy to access. Consider using the binder for filing warranties for your project. It will serve as a record and you may want to provide it as a reference to a realtor or documentation to a buyer if you should decide to sell your home. If you’ve just started collecting ideas some sites to visit are HGTV’s Designer Portfolio which allows you to print, email, tweet, mark as favorite or post on Facebook photos of your favorite design ideas and Better Homes and Gardens, where you can do all those things but you can also “pin” project ideas and articles to Pinterest. 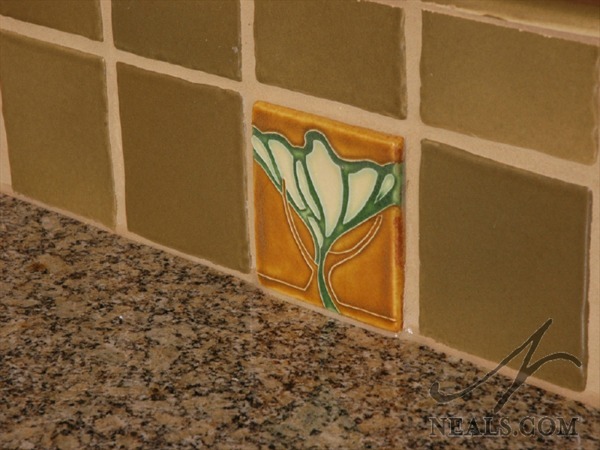 Pinterest is a virtual design board that allows you to collect and organize ideas for your remodeling project. You can follow us on Pinterest because we post photos of projects we have designed and built for people in the greater Cincinnati area and are always adding new photos. Another site for home design ideas that is really taking off is Houzz. Houzz is a home design and remodeling website where more than a million design professionals are listed and provide content to create the world’s largest remodeling database. More than 4.7 million users have created “Ideabooks” for their projects. Why not give it a try? 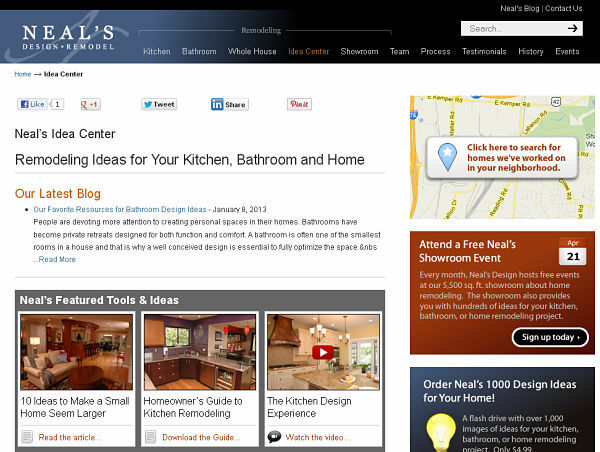 We have, and will continue to add photo’s to Neal’s page on Houzz. We are using our website to showcase many of the projects we’ve built and to provide design ideas to our customers. On our website you will find an “Idea Center” that features a blog with many ideas and answers to questions about home remodeling, free planning guides and videos. Browse our website and sign up to receive our blog articles, newsletter and to attend a seminar. Bring a digital camera or use your mobile phone to take photos if you are attending home shows, visiting showrooms or a home that has features you’d like to include in your project. Create a file and download the images to a computer or tablet or email photos to your Project Consultant as you finalize plans for your projects.